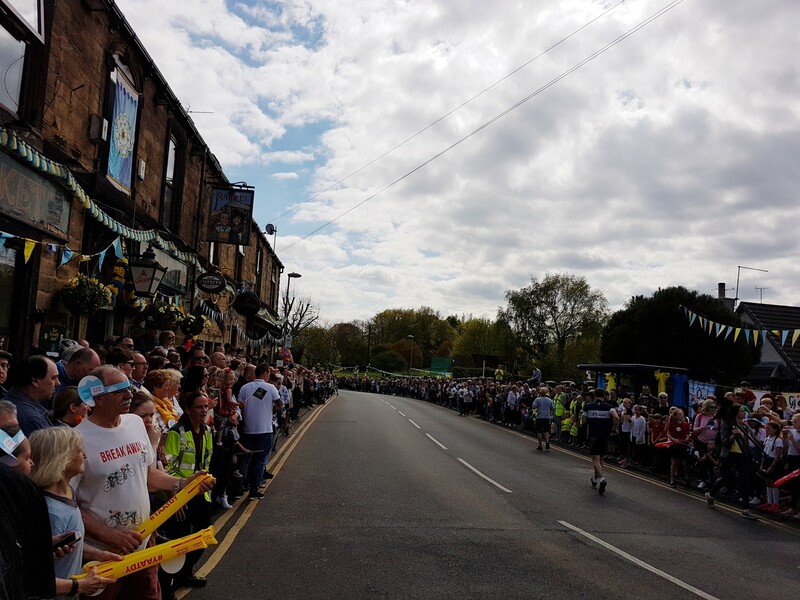 Elsecar in particular stood out as local people chipped in to make the village sparkle for the races. Supported by the Great Place Wentworth and Elsecar team, the effort was steered and sustained by textile artist Gemma Nemer from the Button Tin in the Elsecar Heritage Centre. From mid-April Gemma ran workshops where volunteers spent hours preparing decorations, bunting, pom-poms, and creating printed fabric displays to really make a mark on the day, and the Friends of Hemingfield Colliery joined in the fun. 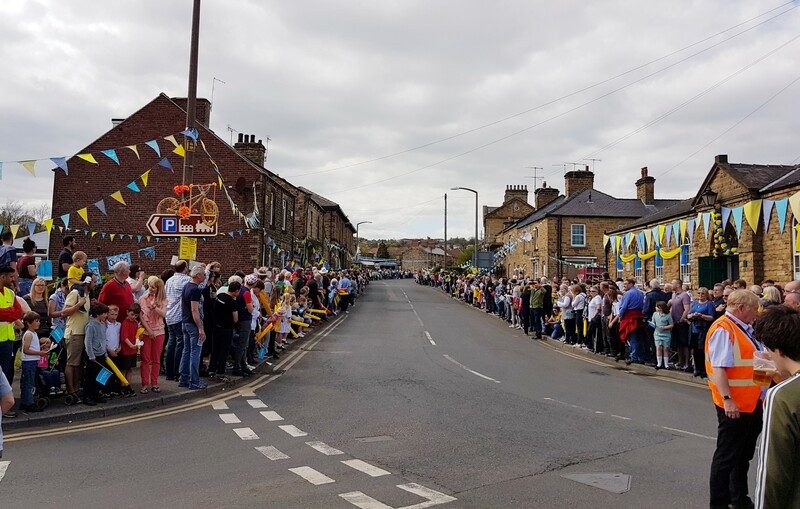 Inspired by images of the Elsecar’s 1912 decorations for a Royal visit, the team at Elsecar set out to cover the village with colour and bring the community together in a celebration of sport, summer and pride of place. Judging by the response of the crowds on the day they more than succeeded as the village was packed and there was a party atmosphere throughout the day. Nearby, on Platts Common Recreation Ground in Hoyland, the Dearne Valley Landscape Partnership and Barnsley Council had commissioned artists Patrick Murphy and Anton Want to prepare a gigantic 90 by 130 metre piece of landscape art to be seen from the air celebrating 50 years since the publication of Barry Hines classic novel, A kestrel for a knave. Meanwhile, up at Wentworth, in front of the ‘Big House’ an even larger piece of land art awaited the helicopter TV crews following the cycle race. Artist group Landmark Collective (namely James Brunt, Rob Conway, Cecilie Browne, Becky Newbould and Timm Cleasby) had been commissioned by Great Place Wentworth and Elsecar to create a unique ‘confetti’ design, inspired by the history of the area. Measuring some 140 metres long and 150 metres wide, it was positioned on the lawn outside the front doorstep to the mansion – visually ‘exploding’ celebrations out into the area. The design and creation involved school children from Rotherham Metropolitan Boroguh Council areas (Wentworth and Kilnhurst). RMBC is working closely with Barnsley Metropolitan Borough Council as part of the Great Place scheme to bring an exciting programme of artistic and cultural events to Elsecar and Wentworth. 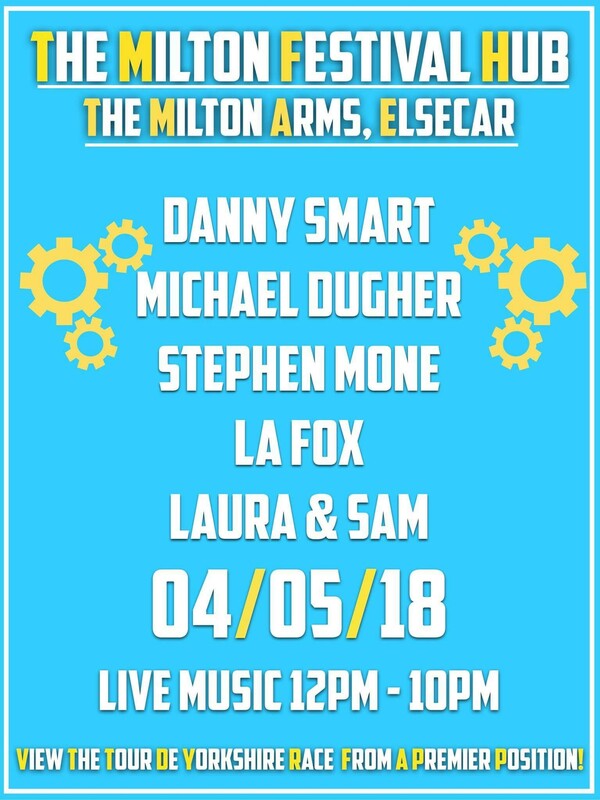 If the cycle races and village festivities weren’t excitement enough, May also means Elsecar Beer Festival time. Working with our friends at Elsecar Heritage Ralway, Barnsley CAMRA had arranged a great weekend of steam trains, ale and music. Throughout the weekend, music and celebrations were spread around the village, with real ales, ciders and live music echoing through the valley. 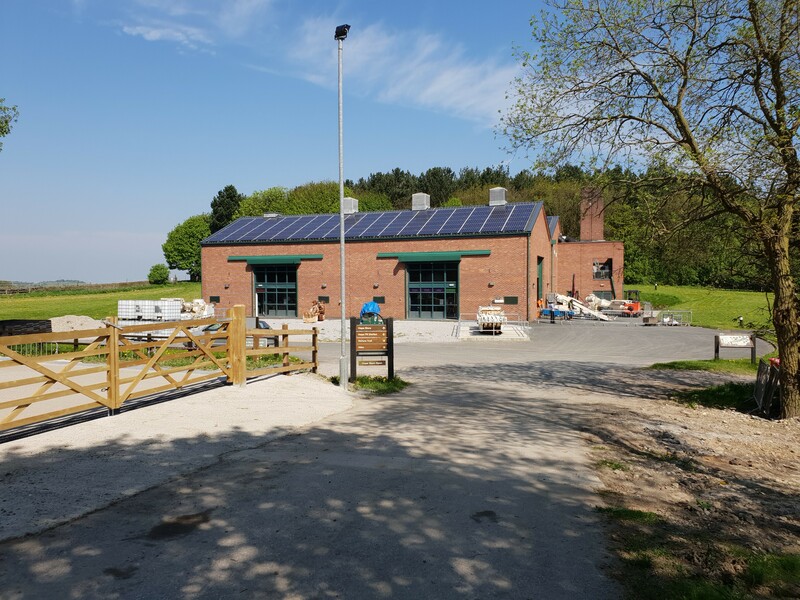 And now for something completely different – the beginning of May also meant an outing for the Friends as the group hit the road and headed up to the National Coal Mining Museum for England at Caphouse, near Wakefield in West Yorkshire. 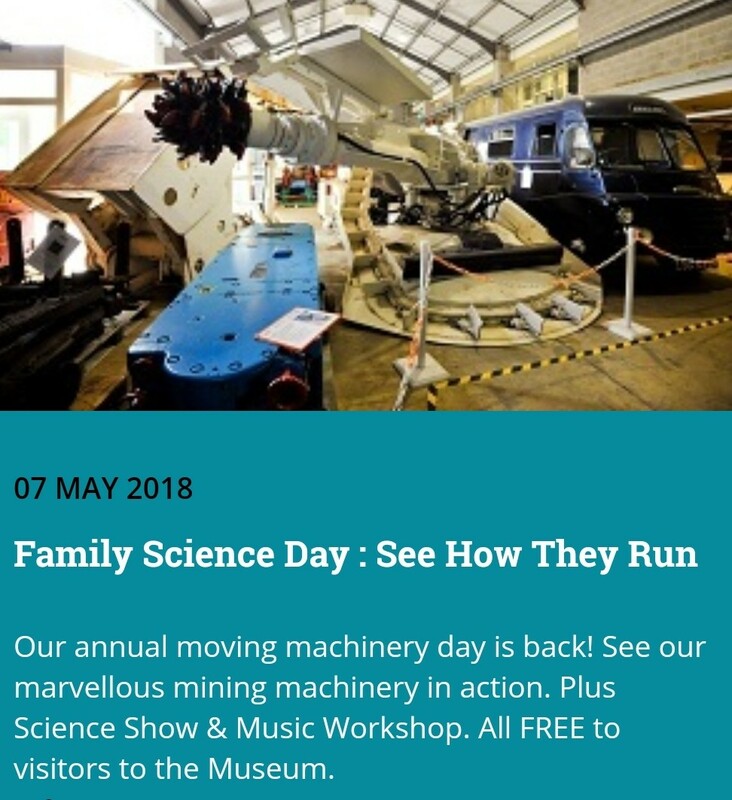 The event was a Family Science Day and the theme was ‘see how they run’ – when mining machinery gets out from the stores and is explained and demonstrated live. The event had been postponed from March when we had snow, but May was certainly a little warmer! What did the Friends get up to? Well, thanks to the sterling efforts of local artist Iain Nicholls, and the support of the Dearne Valley Landscape Partnership, we were able to give an immersive Virtual Reality experience of Hemingfield Colliery as it appeared at the turn of the Twentieth Century. Entitled ‘The Old Mine at Hemingfield‘, and narrated by Barnsley’s very own bard Ian McMillan, the experience had been researched and designed by Iain Nicholls using archival reference material from the NCMME collections at Caphouse, so it was fitting that the VR activity should be hosted in the museum stores, between the amazing collection of artifacts, wonderful objects all, great and small. Arriving at Caphouse, the Friends headed left, up to the Hope pit and the recently developed Hope Store buildings. Visitors can drive up to the top of the Hope Pit site, or take the regular mini loco train from the main Caphouse station. The purpose-built facility provides storage and security to care for a wide range of physical collections, as well as providing a display space which can also be opened for events like this, allowing the public to safely take a tour behind the scenes and see machinery in action. 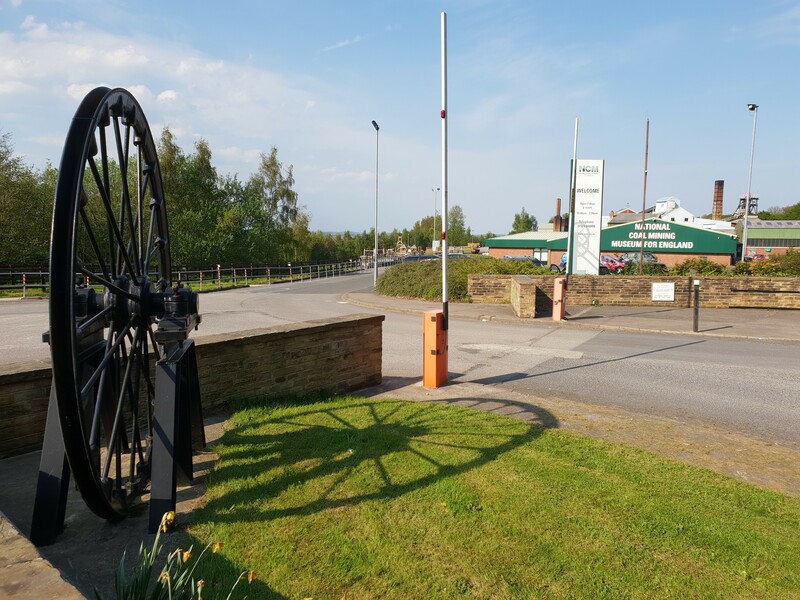 The Hope Store houses an impressive collection of materials relating to the whole history of coal mining in England. Objects donated to the collections housed at Caphouse include weird and wonderful, mighty and mysterious, and all have a tale to tell about the working live of the coal mining communities of the UK. Starting with something massive. Casually tucked away in the corner, we noticed a giant Waddle ventilating fan which helped to ensure the mine workings were swept clear of the potential build up of dangerous gases. On to something whimsical, a man-riding carriage from Rossington Main Colliery – appearing to all the world like mobile park benches. Not forgetting the iconic – a rough-and-ready pit tub (or corf), its construction providing an interesting comparison to the remains of a tub excavated from Hemingfield. The Family Science Day at Caphouse saw lots of families visiting the museum, and witnessing displays of the history of coal mining, as well as love demonstrations of some of the electrical and pneumatic heavy equipment which had been used to cut and convey coal deep underground. Perhaps the nicest contrast of the day, however, stemmed from an archival display of stereoscopic photographs and a chance to get to grips with a stereoscope – a Victorian contrivance using two slightly angled photographs of the same scene which gives an impression of depth in three dimensions to the viewer due to the way the brain makes sense of the separate left and right images. This was coal mining in 3D, with a Victorian headset. Meanwhile, just around the corner, the Friends of Hemingfield Colliery were sharing their own headset, this time a Virtual Reality one, providing an immersive, interactive environment where the user could see and hear the created environment – of Hemingfield Colliery in 1902(ish). Artist Iain Nicholls greeted visitors young and old and encouraged them to have a go with the VR headset – to take a pit top and underground tour, as well as hearing the educational narration from Ian McMillan. Meanwhile, the Friends of Hemingfield Colliery also had a display of mining history and information about the group’s work and future plans. Director Glen, and volunteers Paul and Chris were pleased to talk to a number of visitors, including former miners as well as young people who were interested in the history and heritage of the mining industry in Yorkshire. On a super sunny day, the cool stores also made for a very comfortable environment to explore the treasures of the NCMME’s collections. At the end of a beautifully summer’s day, the Friends headed home, having spent an enjoyable day at the museum. Au revoir – be back soon!